So here's the thing. I saw this pair of Chloe boots and walked away. I didn't think twice. Then, as I was five feet away from the shoes in question, I felt a sudden magnetism and turned back. THIS has never happened before. When I love a pair of boots, I love them from first sight. My love of boots can easily be compared to most people's most romantic loves over time. I get goosebumps on my arms, chills run up my spine and my mind immediately races with questions like "how many hours will I have to work before I can afford to have these as my very own best foot friends?" That all being said, I've never had a "walk away, then run back" moment. But, I think that's all down to the shearling cuffs on these Chloe creations. Upon first glimpse I thought they were another step into fashion from the folks over at UGG. Then, after closer inspection, I noticed there was fabulous fashion finery to be discovered in this shearling pair. In fact, I actually discovered there was one detail, in particular,that had me smitten. There is a drawstring on these shearling boots. Call me odd, but I love a drawstring. Whether the drawstring is on a bag or the top of a turtleneck, I'm a huge fan of the drawstring detail. In my opinion, this sort of detail can never have enough air time in fashion. Naturally, my love of boots never comes with a £20 price tag. Why, oh why?! 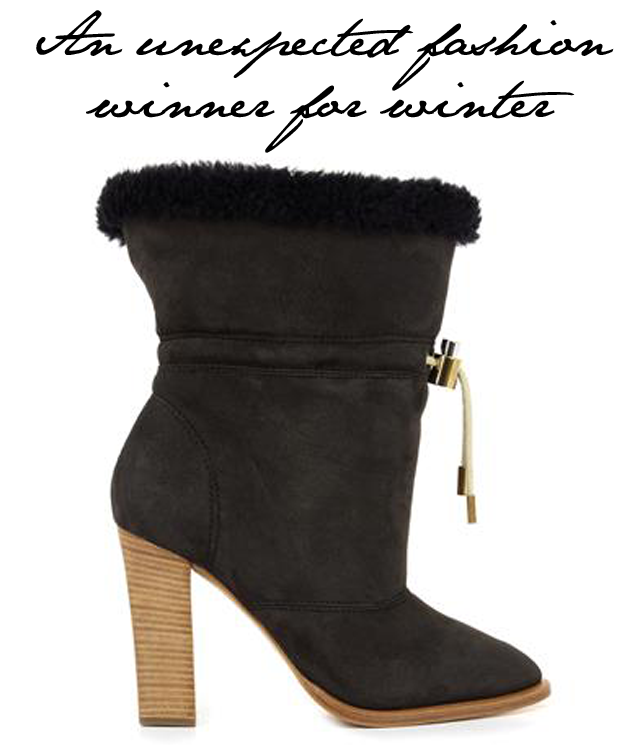 These Chloe Drawstring Shearling boots definitely have a rather impressive buying figure. So, that's me off to apply for a second job, preferably with a location near Chloe so I can check in on my work-inducing sole mates.